The following interview was conducted on October 15th, 2005 at the University of Melbourne. Apart from being one of my heroes, Daniel is one of few designers and teachers out there putting permaculture to its full effect: redesigning society. Apologies for making you wait so long to see this. Douglas Barnes: Could you give us a brief outline of your permaculture history? Daniel Jaramillio: Alright. 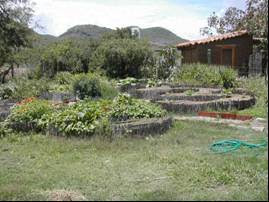 I learned about permaculture in 1997, while studying agronomy in Costa Rica, from Introduction to Permaculture and I thought it was very interesting. I had been going that way. I had been studying agronomy for 2 years and I realised how there were a lot of nutrient cycles and energy cycles that were just broken by our own stupidity, really, you know? And that could be put together to make something that makes more sense. So I was thinking that way and then I found permaculture and I was really excited because then I didn’t have to figure it out. That would save me a lot of time, yeah? Someone had done it already, so I didn’t have to do it. So, I just started from there. Then in 2000, I finished school and I was looking for what to do. I was living in the United States then ready to leave. And I found that they were teaching a course at Tagari Farms, Mollison’s farm. But the course was taught by Geoff [Lawton], and I applied for a scholarship. And they gave me a scholarship, so I flew into Australia and I stayed in Tagari Farms for a month and a half. I took the course and spent another month working. We were doing a lot of work with the chinampas. Then I went back to California, which is where I was living, to meet my girl then. And my daughter was born in February and we moved down to Mexico to Guajaca, to the coast of Guajaca to work in a small village. It’s a little village on the coast with campesinos there. And we started doing a community project. We created a community compost piles, we introduced bamboo there because they used to use a lot of mangrove. But the mangroves were gone because of a hurricane. Anyway, I stayed there for that year then went to Colombia. In 2002, I sent up a centre again in Mexico, a demonstration and education centre. We designed that and did the earthworks with Geoff. Geoff flew there. And then last year, I taught a course together [with Geoff] in Mexico again. And I registered myself as a teacher with the Institute in December. I taught my first PDC this year in March and here I am. Douglas: You’ve done a lot of work in community building. Could you tell us more about that? Daniel: You’ll find a lot of ideas and approaches to permaculture. But I believe that if we are really into preparing the ground and set up for some kind of change, we need to work with the community. We have to stop thinking that very western way of thinking of fencepost to fencepost, yeah? Because it doesn’t work like that. It won’t work like that. I mean, we can’t keep on doing things in so selfish a way. So, I think one of the most important tasks in permaculture and what permaculture is really about is community work. Obviously in community work, we use appropriate technologies or appropriate techniques that can be based on the permaculture ethics of care of the earth, care of the people and sharing the surplus. So, you kind of build up capacity in people. And it’s very clear how you can definitely make a strong statement to them of what the problems are. I’m in the third world, yeah? So, we definitely don’t have to look far to see the problems that we have there, yeah? How they suffer and how easy it could be to just solve those problems if we start being responsible for our own basic needs. That’s all it is about. But always from a community point of view, not in a selfish way. Then we can help each other because we don’t have to all grow our own potatoes, you know? There are many things that need to be done and many jobs that, if you spend your time growing your corn or your potatoes, you won’t have time to do. You know, each one of us has a role in the community and the bioregion. So, I’m living in a community that is all doing community work, and that’s all we do, really. I mean, I have some private things, and also, well, the family is mine, but the family reaches out to the community because I feed, like, 40 families with organic vegetables. Some of them are in the rich part of town. But some of them are very poor people and they pay less or they actually pay me with other things. We barter, yeah? But because you cannot just grow organic food for the rich and let the poor eat chemically grow food. So, it’s all about, for me in Colombia, it’s all about healing community. And obviously you know the problems that Colombia has. You know Colombia is a very troubled country. There’s a lot of creativity in the people. It’s just that energy is put into war, so people just see war or drug trafficking, yeah? We can focus that in more creative ways that would heal our society, you know? Douglas: In your presentation that you gave this week, you mentioned that in Northern Colombia, a village you were working in reached a food emergency state. What happened there? Daniel: Well bro, in Colombia you have a lot of coca. There’s coca growing all around to make cocaine, yeah? The United States through the Colombian government – this is the new type of dictatorship state – they have this spraying program, yeah? They are spraying Roundup and all sorts of things. Campesinos tell you like a year and a half ago, they started seeing all these little worms appearing in all their crops. And they are sure it came from the airplanes. But, supposedly, it says in the papers in the States that it’s just Roundup. Well, it’s not just Roundup. But still, we don’t know exactly what they are spraying. But they sprayed this area, which has a lot of coca. It’s a very frontier area of Colombia, yeah? Where there is not much presence by the state. I mean, maybe there is presence of the illegal groups [right-wing paramilitaries] and with some of the groups you can clearly see how they cooperate with the state, yeah? And the only presence of the state is just the army that goes in and out and just wreaks havoc, yeah? But there is no presence of the state for health or social services – what people really need, yeah? So people need to look for a way to live and they were ripped of all their traditional knowledge, you know. And now they are dependent on money. Well, the only thing they can grow to make some money is coca, so they grow coca. And the thing is that they are spraying this right now with Roundup. They’ve been doing that for many years now around Colombia. But they are now spraying even the national parks because some people have started to live in them in the frontier areas of the national parks planting coca and they [the government] just go and spray them, you know? There is no social program that would accompany that. So, people who are chiefs, are corrupt or are secure, they don’t really need that. They are just, you know, who knows the senator that is being supported by Monsanto which does all the lobbying – the United States senator says we’re going to spray down there. You know how those things are. So, yeah, they are spraying all around Colombia. It’s United States contractors that they want to spray. It’s not the Colombian government spraying. It’s United States pilots, United States planes. Colombian army helicopters accompany the airplanes that spray. They not only spray the coca, they also spray the forests and the waterways. I mean, bro, there’s so much evidence and so many stories from the campesinos of what they are suffering with these sprays, yeah? Because all their food is gone. All the cash crop is usually gone, too. But the weird thing is they tell you and you see it too, and I’ve seen it with my eyes – I won’t be afraid to tell anybody this – you see big crops of coca high in the mountains not being sprayed. But the small ones low in the valleys, the small ones, the campesino ones are the ones sprayed along with their food. What happens with these people is the war gets there, they hear these planes, they go to poor areas of the cities, you know? And they become really cheap labour to export [cheap goods] that work without any social benefits or anything. So that’s why I work with community in Colombia, yeah? Because we need to build capacity. And the state programs are not building capacity. And we are pretty much like the lawn of the United States. They go there and do whatever they want to. If they did good things, they would be very welcome. But they are just ripping our country apart and killing our people. So this community is in a food emergency. It was sprayed two weeks ago and as we speak they are in a food emergency. They don’t have any food. And the problem is that the paramilitaries, the right-wing paramilitaries, which do cooperate with the state army and police – they are illegal – they deal a lot with drugs and that’s well known all around Colombia in newspapers and magazines and the government knows that. But they also know, and I have seen it with my eyes, I have seen how they cooperate. There’s a roadblock, a police roadblock, but there’s a paramilitary telling them who to stop. So, they do cooperate. They don’t let food go up because the guerrillas live up in the mountains. So these [villagers] are the people who are in between. I mean, they are confined, you know? And now they come and spray them, so they are in a food emergency. The only food that really reaches those parts is the food that is sent by the World Food Program or these humanitarian aid organisations backed up by the United Nations. But the paramilitaries don’t let any food go up, so it’s really tough, yeah? We were there. You know, we go up because we are being contracted by an international aid organisation, a human rights organisation. So, yeah, we usually have a very high political price, yeah? So, we can just go in and out. And usually all the permission is taken. We ask, we send messages and things. And now that they have sprayed, their crops are gone, so they don’t have food. And we need people to know this. That’s why I’m not afraid of saying this because we need people to know this everywhere in the world because borders are really obsolete, yeah? We get to a point where we know that if in Japan they pollute the air, that air is going to reach Colombia some day. Or that water, too. So we have to work together all around the world. Everybody has to know what is happening there as much as we have to know what is happening here. But people just don’t know. And the governments, the empires that are ruining the world and that we are supporting by the way we buy, by the way we consume, by the way we think, by the things we say, by the way we behave. All these things are doing those there, yeah? And we cannot support that anymore.